The weather here in New England is showing us a little grace–warming up enough to let the daffodils pop out from the ground. I love this time of year because I know summer is just around the corner! Russ and I had a busy weekend including a long walk with Lucy, dinner with 2 of my 3 kids, a spin ride on Sunday and ended the weekend with a Fleetwood Mac concert. A perfect mix. I also fit in a 15 page paper for one of my classes. Only about 3 months left of school and I will have my Master’s in Public Health wrapped up! Although we had a full weekend planned, I also fit in some fun time in the kitchen. 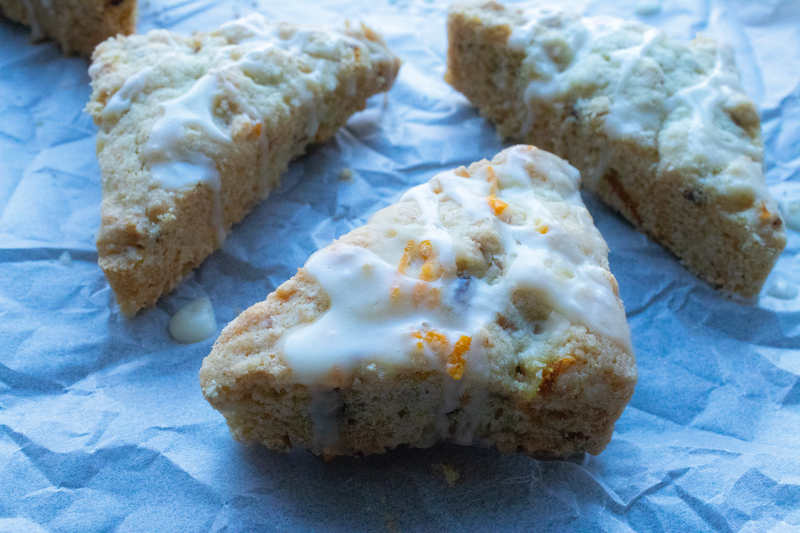 Today’s recipe is a low FODMAP and gluten free scone recipe. I added plenty of orange zest, a small amount of dried cranberries, and chopped walnuts. What really made the scones special though was the light drizzle of orange zested glaze. This post contains Amazon marketing affiliate links. I used my mini scone pan because I love a mini treat. But you can make two rounds out of the dough and cut into individuals scones too. It’s best to use a gluten free flour blend with a little xanthan gum for the best texture of the scones. It’s possible to use a gluten free flour blend without gums but you will find some of the scones will break apart easily. I like to use Bob’s Red Mill Gluten free 1 to 1 or King Arthur’s Gluten free Measure for Measure for this type of recipe. When selecting dried cranberries to use in this recipe be sure they are not sweetened with apple juice (to ensure they are low in FODMAPs). I used just a small amount for the delicious cranberry flavor. I also chopped them up so that you get a taste of cranberry in every bite. You will find in the recipe that I added regular sour cream. Although sour cream is a source of lactose, the amount in the recipe is just 1/4 cup, adding minimal lactose (~0.5 grams) to the serving size. You can sub in lactose free sour cream, but remember food intolerance is very much portion driven. This amount should be well tolerated and meets the low FODMAP cut off. Serving size: 2 mini scones or one medium sized scone. Yield: 16 mini scones; 12 medium scones. Prepare scone pan if using or add parchment paper to baking sheet. In large bowl, add flour blend, baking powder, soda and sugar. Set aside. In small bowl, mix egg and sour cream, set aside. Slice butter in bite size pieces and add to flour mixture. Using pastry blender or hands, mix butter into flour mixture until the mixture resembles course crumbs. Add sour cream and egg mixture to flour mixture. Fold in orange zest, cranberries and walnuts. If using mini scone pan, add dough evenly to pan. If making scones into rounds, divide dough in half. Make 2 small rounds with your hands. 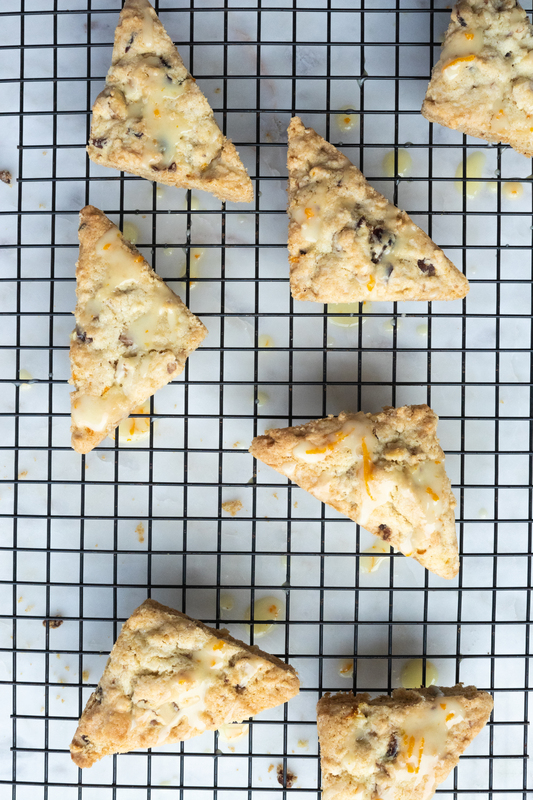 Cut each round into 6 triangular shaped scones (like cutting a pie)and place scones on baking sheet about an inch apart. Bake scones for 15 minutes. The scones should be lightly browned on the edges. While scones cool, make orange glaze. Simply add confectioner's sugar, zest and orange juice and mix with a fork until blended. Drizzle over scones. In other news, today is April 1st and the beginning of IBS awareness month! 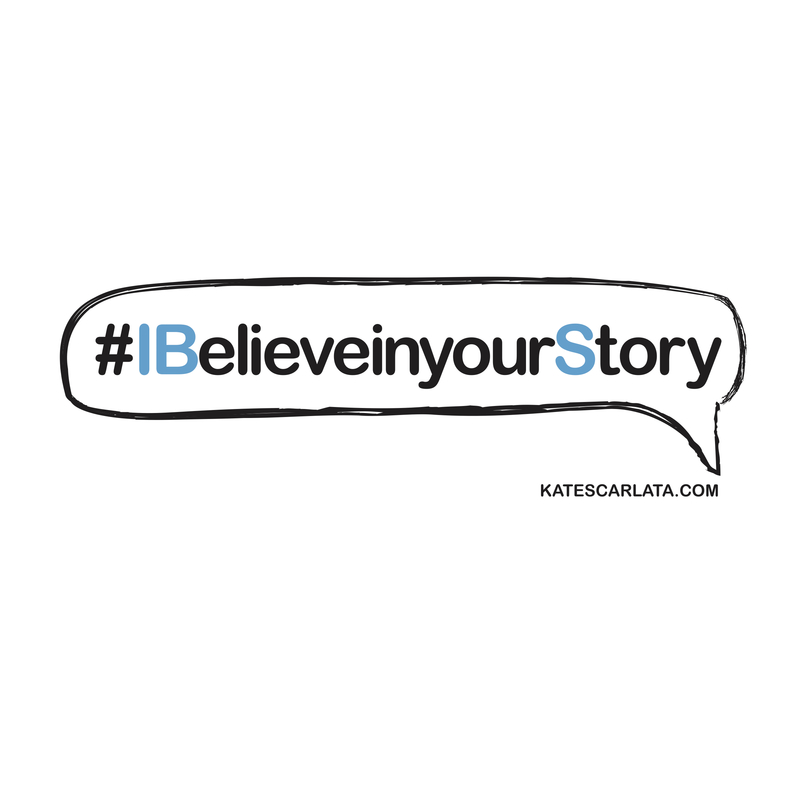 Join the #IBelieveinyourStory campaign by using the hashtag on your social media channels. You can click on the photo below and share as a post or profile picture for the month of April. Also, check out my shop to purchase swag and support IBS research! Please verify amount of butter. Also, can I use regular flour? Yes, 12 tablespoons butter (1 1/2 sticks). You can use regular flour if you are not following a gluten free or low FODMAP diet. Thanks for the info! I’ve never made scones before but 12 Tbsp of butter sure explains why I love them so much! LOL! My husband and I think the Slow Cooker Mojo Chicken is excellent, especially like the sauce drizzled over the rice and chicken. The recipe is a keeper!